Wash & clean ginger, green chilies and grind them to a coarse paste in a mixer grinder. Heat a pan and add oil to it. When oil is hot add the cashew nut pieces and fry them. Fry the nuts till they turn golden in color and keep them aside. Heat a pan and add oil to it. When oil is hot add fenugreek seeds and black gram. Fry till the seeds start changing color. Then add mustard seeds and cumin seeds. Fry till the seeds splutter. Then add curry leaves and ground ginger-chili paste. Fry well. Now add water and salt. Mix well. When the water starts boiling lower the flame and add the ghee. Then add semolina little by little and mix. Cover and cook for 3 minutes. Remove the lid and mix the upma well. Switch off the flame and add fried cashew nut pieces and lemon juice. Mix well and serve hot. Take care while adding semolina to the boiling water. Add very little quantity of semolina and mix with a spoon. As there is more water compared to the semolina we have added, it will get mixed immediately. Then add some more semolina and mix. Like this finish off the semolina which has been taken. If one follows the above procedure there won’t be any lumps. If you add all the semolina at once, then it forms into a big lump and will not get mixed with the water. Adding right amount of salt brings the perfect taste to the dish. After adding salt taste the water and check it. It is better to add salt at this level which gets mixed well with the water. If you add salt after the upma preparation is over, it will not get mixed well and spoils the taste. To avoid lump formation one can dry roast the semolina before adding it to the boiling water. Take water in a bowl and let it boil. Simultaneously prepare the seasoning on another stove. After frying the seasonings add the semolina, ghee & salt and fry well. Now add the boiling water to the mixture and mix well. Add fried cashew nuts, lemon juice to the upma. Mix well & serve hot. I avoid doing upma the above way because when we add boiling water to the semolina it splutters and makes a mess to clean the gas stove. This upma is also served with Pesarattu and we call it Pesarattu-Upma or MLA Pesarattu. 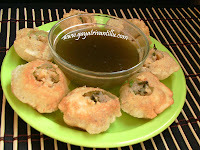 Your recipie presentation style i like so much.Could you please letr me know how to make some south indian sweets. నా పేరు చిన్నా బాబు,మాది ఆంధ్ర నే, ఉద్యోగ రిత్యా దుబాయ్ లో ఉంటునాను, నేను మా ఫ్రెండ్స్ తో కలసి ఉంటునాను, బ్యాచలర్స్ ఎలా వంటలు వండుకుంట్టారో మీకు తెలుసు, మాకు ఎప్పుడు పప్పు అన్నం, కాకుండా కొత్తగా చేసుకోవాలని పిస్తే మేము ఇంటర్నెట్ లో బ్రౌస్ చేసి, వంటలు గురించి తెలుస్కోని చేసుకుంటాము, మీ వెబ్సైటు లో పెట్టిన వంటలు మాకు నేర్చుకోవడానికి సులభంగా ఉంది. పుట్టగొడుగుల తో వంటలు ఎలా చెయ్యాలో చెప్పలేదు, మాకు పుట్టగోడుగులంటే బాగా ఇష్టం, దయచేసి వీటిని ఎలా వండుకోవాలో చెపుతారని ఆశిశ్తునము. 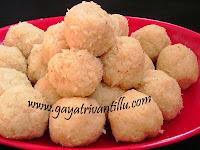 My name is Santhi and I really love your website gayatrivantillu.com. Your recipes are so good. All the instructions are very clear to follow. Thank you very much for this great website. 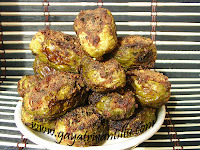 Nenu entha try chesina, i could not get the taste of Mom's cooking. kaani mee recipes follow ayi cheyyadam start chesina tharvatha, aa ruchi naa vanta lo konchem kanipisthondi. Thanks a lot for your time and effort. People like me are greatly benefited by Gayatrivantillu. This is jyosthna.How is ur job doing?Your dishes are awesome..nenu online lo curries gurunchi chudalante i directly go to ur site.Frankly to say nenu mee site chusi cooking narchukunnanu..the way you tell clearly is very appreciative.Thanks once again..
Thanks﻿ Gayatri Looks great and easy to prepare. I will try this sometime soon. Thank﻿ you Gayathri for this simple and nice preparation. Sudhakar - Netherlands.